– Future development of the Campaign related to the Brandeburger Tor Action. Campaign launched with a strong mobilization from Lagers. Success of the campaign is to have created a long term resistance which echoes in Europe. Social and Refugees movements together against Isolation in Lagers/ Residenzpflicht / Deportations / Police violence. Challenge for the future is to create a form of political organization. The existing organizations and networks as the Caravan had not the capacity of mobilize refugees as the Protest march did. Understand the story politically is the condition to go forward, learning for the future. It makes no sense to “jump the bodies” of the ones, groups and networks, those are working politically since years. The Caravan network is inside the very beginning of the Protest march as self-organized network of refugees and migrants, as political community and infrastructures. People understanding themselves as a part of the caravan project, have been mobilizing inside the campaign without any concern of identity. Nevertheless the problem of a supposed attempt to take over the Campaign by the Caravan was used as a pretext by a small group of decision makers to split the movement. They decided unilaterally to leave the Camp without discussion, delegitimated politically the Oranienplatz camp, leading alone the negotiation with the politicians. We are in front of an inner sabotage of the Campaign. This movement decided not to have leaders, bringing together people of different cultures. Even though there are people who have leaders, the movement create his power from inside. Now this movement is not limited to Refugees. Is an anticapitalist and antifascist movement. We discussed about the hungerstrike during 5 days. What was the meaning and what could bring. In the initial time had a strong impact but in the long term it made the movement weaker. The hungerstrike was interrupted and restarted. The hungerstrikers couldn’t stand strongly in front of the politicians but the protest is not finished. Need to find new connections. It is a learning process, we are learning from ourselves. We learn also from the sabotage. Reactions of dissent to this point of view about the recent history. Somebody reaffirm his conviction of the Caravan as an outside influencer of the Campaign. Focus on solidarity. A three weeks hungerstrike was made in 1999 for the same demands. What does it mean? Has this movement began eight months or 15 years ago? It’s no issue “who is representing the refugees” but “who is representing the demands”. It’s a pity if people is thinking not to join the demands for this or that political subject. We had hard moments. Many misunderstandings were made on purpose. Some are speaking starting from the interest of the own Community. We have to avoid to create a “enemie’s image”. Transparency and unity needed to make this revolution together. It makes no sense to speak only of the past, when sabotage or manipulations took place, to accuse them is to make their effect stronger and make obstacles for ourselves going ahead. The issue is not about excluding or demonize anybody. It’s about to find the political focus. The selforganization of refugees created the present uprising that we are living in the Oranienplatz camp. Hundreds of peoples broke the Residenzpflicht and the German state has to face this situation bringing everybody to trial or abolishing the law. This is changing the law from below, not begging the politicians to do that. There is a difference between selforganization and political advertising. We have the responsability to go on mobilising refugees from lagers and to last in the long term. Another issue we’ll have to face is the communitarism, the ethno politics, made partially of the inconscious reflex of feeling together with people speaking the same language, but also of the interests of the particular group. The influence of this community logic on the Campaign has to be evaluated. Again discussion about the division with Brandeburger Tor action. 4 demands or 3 demands? What does the fourth demand mean? Is enough to say there is a political difference? Are some people standing for their own passports? Following rumors is not helping. What are the demands, and whom are we demanding? To the Bundestag… or to ourselves? The selforganization answers. We ask to abolish the Residenzpflicht to whom? We ask for german courses or we organize them? No time to discuss the last issue of today: the request of changeover in the group administrating finances of the camp. پریشب به ایلم زنگ زده بودی و باز هم کوبیدن به کاراوان، باز هم تهدید بیخودی. نگاه کن، کاراوان همیشه شفاف بود و خواهد بود. تصمیمها مشترک گرفته میشوند.در عمل عقب نمیریم. در دوسلدورف بهت پیشنهاد کردم، هر انتقادی که داری بنویسی‌ و من ترجمه کرده در اختیار همهٔ دوستها خواهم گذاشت. در همون دیدار هم بهت گفتم که فرقی بین آراز و کاراوان وجود نداره. زنگ زدن به تک تک دوستها اتحاد در کاراوان را نخواهد شکند. تهدید معنی‌ نداره. اگر انتقاد درست و واقعی داری هر چی‌ مشخصتر بنویس و من در اختیار همه دوستها در کاراوان خواهم گذاشت. بیخودی زنگ نزن، من جواب نخواهم داد. همراه این نامه برات تعریف کاراوان را میفرستم که اصول کار ما را آشنا شوی. yesterday night you had called Eylem. Again you smashed the CARAVAN, again you threatened. Look, the CARAVAN has always been transparent and will be. The decisions are made collectively. In action we do not withdraw. In Duesseldorf I asked you to write down the critism you have, that I would translate it and share it with all friends. In that same meeting I told you that there is no difference between Araz and the CARAVAN. Calling single people does not harm the unity within the CARAVAN. Threats do not mean anything. If you have a proper and real critic. Write it down as concrete as possible and I will share it with the friends within the CARAVAN. Do not call without sense. I will not respond. Together with this letter I send you the description of the CARAVAN, so you are able to understand it. I called you and Eylam because I thought I had a personal friendship based on what we did in Dusseldorf. now that you know yourself just as a member of The Caravan, and when there is no any difference between Araz and The Caravan, any thing happens from now, in my view, there is no any difference between different people in The Caravan and its a struggle between me and one Organization which does lobby. I also told you in Berlin that I think you could stop so many bad things which can happen, even I told you that these bad things are happening with your lovely friends in Oranianplatz, I told you that these people are misusing the position of having the sources like finances and putting asylum seekers out of media work group media, and you replied : these all are rumors and I know my friends for many years. but now with the protocol of the meeting on 25th in Oranianplatz (Its in the end of this email) and it got sent to the email list of Berlin strike, those bad things I was warning to you, just happened. even after that email, I wanted to stop myself for taking action with calling to trust worthy people that I knew.but with this email that you published in email list, you (all) lost the last chance for saving the 17 years image of The Caravan and active people like you and Eylam beside those people that they are addicted to alcohol and even beside those that they are secret services which they are in Caravan, will get erased from the political atmosphere. for me these Positionpapers that you sent me, which are nothing just some PAPERS has no value, because the treatment which I have seen from the faces of Caravan (your lovely friends like Claudia) in practice in Berlin is the first and last source to know The Caravan. still its really interesting that the protocol of refugee’s meeting has to get sent by Claudia and it seems there is no any asylum seekers which can do it, even the moderator was himself (Claudia) and your silence in front of this, is under a big question mark. have in your mind the date of this conversation and wait for what will happen in future. I know it is painful not to answer such a mail especially those who have had the opportunity to deal with Arash but I do not think it is worth answering thos mail. I don’t know if he is in the internal list but from this mail, I guest he is. I can also guest that the reason he was put in this list was because we thought he was part of us, just like any refugee or migrant should be. But from all his actions, reactions and conspiracies, we now know he is not. Not only from this mail, I have got the opportunity to discuss with him and even tried to work with him but I do not think he is up to the challenge which I or many other activists within the Caravan face. I think he (and any of his kind) should be removed from this list and any queries which he or any other person from his clique has, should be channeled theough the refugee strike list (administered in Berlin) and if it concerns us, activists of the Caravan, then we will discuss it in the internal list without distraction. I am a refugee, not because I wanted, it is because I was forced. I will fight all the way to make this status not stick on me. Let us please not respond to peple who do not want to understand us and ignore them as much as possible. The fight did not begin here and will not end here. Our energy should be put for better things and threats are part of our challenges. those who receive this mail, and those who believe that it has to be Dialogue, not Monologue, please send it to the internal list. because ignoring is Monologue! even we have a better suggestion, why not to have this discussion in front of all of those people who care about this struggle in PUBLIC? at first these sentences which says: “part of us”, shows how are the views of yours. everything out of you is a little part of you (big us). sorry but we were never part of anything, but the cooperation based on trust, was what we used to do. but this kind of activities can just happen when trust is existed. trust which is not there anymore. when Caravan members use to tell: 1-Before protestmarch in Berlin, Ashkan was told that this action is short term action and we are busy with our long term projects like summer camp in Erfurt(ask Mbolo).2- becase in Erfurt, it was said that : some kids think that they can do this big thing (ask Araz).3-when we were defending OUR project in erfurt meeting in summer camp, and we had to describe for more than 9 hours that bus tour is possible, still some people were laughing at us because they did it before and it didnt work, because it was a dream and we had to forget about it! (ask Osaren). 4-because in the meeting of protest march in the night in erfurt, some people used to say: this Project has 3 sides, asylum seekers, Autonomos activists and The Caravan. (ask Claudia).5- in 7 meetings of organizing the whole project, Caravan was in just two of them, even one of them was a meeting to just tell us its impossible. funny is caravan was not in any meeting of organizing the bus tour but now, some people are telling everybody that it got organized by caravan(check what got published by the tent of Berlin before protest march in TAZ and even check the protocl of oranianplatz which is saying it).6- we tried to collect money, all of the tents were spreading the call out of the donation help, and we asked all of those people who wanted to give us cash, to send the money to caravan account, now rumors about we stole money from account is coming and finances, just because its in caravan account, now is called: Caravan money(review all discussions about finances and hear what financial work group of berlin says! ).7-in the meeting 26 August in erfurt, caravan members were saying that they are happy that a leader like Osaren is with us, and no one criticized(ask Osaren) and all of you criticizing us that we are leaders.8-we trusted to give all accesses to informations.the general passwords of website was in the hand of Caravan members but finally Arash got fired from the media workgroup meeting and none of us still have the password of it(ask Claudia).finances and media were two heart of the protest.9-….. .how many do you want us to count for you? there was a trust that you expired it. Mbolo,you said in Berlin that we are poisoning against Caravan, can you just leave the struggle for a moment and spend 2 minutes to read the protocol and see who is Poisoning? of course you have to ignore us, becuase in Berlin, in front of police station, some one said that those refugees who dont want to work with our structure, is better to stay in their camps until they learn how to fight(ask eylam). of course you have to ignore us because in big Berlin, the fixed structure of berlin tent which announced itself as a Caravan tent, have a mailing list with 80 mails (no more people are insider). of course you have to ignore us because there is a structure which everyone has to allow it because some people are doing it for more than 17 years. so if you didnt get understood by others, they have to get ignored because you are the most right people to do these things on the earth, on others are doing it in wrong way so they have to get ignored.who thinks is the leader? who’s activities is based on Elitism? late for asking these questions and the pity was the trust which were based on organizing from below,cause there are some KIDS that they dont accept the structure of experienced active people, THEY HAVE TO GET IGNORED OF COURSE! as you choosed the ignorance as a Solution!, we thought maybe writing down the history of 8 months (short term project of asylum seekers as Mbolo said before), because we think it has to get transparent to get solved, no mather how much consequences it will have. en Verstoß gegen internationales Menschenrecht der Bewegungsfreiheit darstellt, ist Teil des Protestes und Arash bricht dieses Gesetz genaugenommen seit dem 19. März diesen Jahres. Diese Verhaftung kurz vor dem Begin des Protestmarsches ist eine klare Schikane und muss als Versuch gelesen werden den Protest von Seiten der Behörden zu unterdrücken.Das Koordinationskomitee der protestierenden Flüchtlinge verurteilt die Verhaftung von Arash Dust Hossein und erklärt hiermit das wir alle die Residenzpflicht nicht anerkennen und Seite an Seite gemeinsam mit Arash kämpfen werden bis diese unmenschliche Gesetz abgeschafft ist. Einige der streikenden Flüchtlinge befinden sich ab sofort im Hungerstreik bis Arash Dust Hossein freigelassen wird. 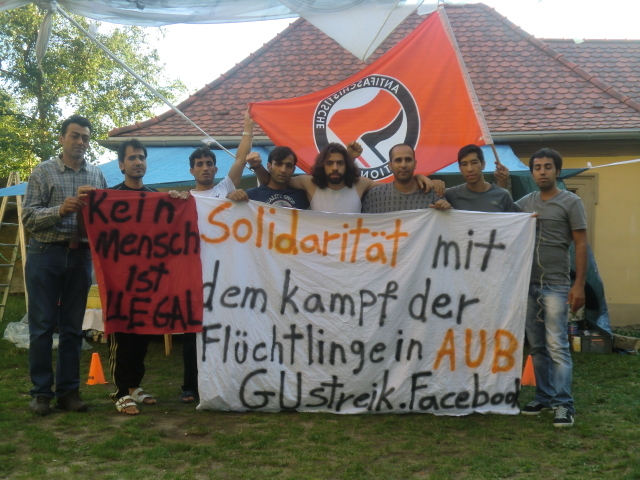 Arash Dust Hossein, one of the first striking refugees, has been arrested by the Würzburg police on Wednesday 05.09.2012. Arash has been protesting on the street since March 19th, including long periods on hunger strike. Now he is being accused of breaking the “Residenzpflicht” law (restriction of movement ). While Arash has technically been breaking this law since March 2012, there is reason to believe his arrest, shortly before the refugees march begins, is in fact an attempt by the authorities to hinder the protest. For the time being, Arash has been transferred to the police station on Augusting street in Würzburg. The coordinating committee of the Striking Asylum Seekers in Germany is announcing that they do not acknowledge the Residenzpflicht law, and call to abolish it. The committee will fight till the end, side by side with our striking comrade Arash. The shameful arrest of Arash Dust Hossein proves nothing but the continuing persecution of asylum seekers by the authorities; therefore the coordinating committee announces that from now on, some Striking Asylum Seekers are going on hunger strike, demanding the immediate release of Arash Dust Hossein. روز چهارشنبه مورخ 5.9.2012، آرش دوست حسین پناهجوی معترض که از تاریخ 19 مارس برای مبارزه با قوانین ضد انسانی دست به اعتصاب زده است،به دلیل ترک محدوده تردد خود و حضور در شهر ورتسبورگ، توسط پلیس این شهر بازداشت شد.در اولین ساعات امروز پلیس محلی ورتسبورگ با مراجعه به چادر اعتراضی وی را به دلیل نقض قانون محدوده تردد، که اساسا وی از تاریخ 19 مارس این قانون را به رسمیت نشناخته و با پیوستن به اعتصاب 19 مارس شهر ورتسبورگ متن آن را زیر پا نهاده است،بازداشت و به ایستگاه پلیس در خیابان آگوستین شهر ورتسبورگ منتقل کرد. کمیته هماهنگی اعتصابات پناهجویان اعلام می دارد که همچون آرش دوست حسین محدوده تردد را به رسمیت نشناخته و نمی شناسد و برای برداشتن ورق پاره ای به نام محدوده تردد تا آخرین لحظه در کنار هم سنگر خود مبارزه خواهد کرد.بازداشت شرم آور آرش دوست حسین بیانگر هیچ چیز جز جاری بودن یک مبارزه تمام عیار میان پناهجویان اعتصابی و حاکمیت نیست ، به همین منظور، کمیته هماهنگی اعتصابات پناهجویان اعلام می کند که جمیع پناهجویان اعتصابی در آلمان از همین لحظه وارد اعتصاب غذای خشک شده و تا آزادی بی قید شرط آرش دوست حسین، اعتصاب خود را نخواهند شکست.